Gul is jaggery, pohe is flattened rice and vadi is burfi. Pohe being one of Lord Krishna’s favorite foods, are offered to Him for the Janmashtami festival, which celebrates His birth. I love the mythological story about Sudama’s gift of pohe for Lord Krishna. It teaches us all a valuable lesson that gifts given from the heart are far more precious than any other gifts. Gul pohe are made with jaggery, coconut, ghee, nutmeg and cardamom mixed with flattened rice or pohe. They are not a favorite with my kids. So I decided to make a vadi/burfi with similar ingredients adding almonds and roasted dal/dalia to it too. So the yummy Gul Pohe Vadi is a winner all around! I especially loved the crispy texture of this vadi and the fact that I could sneak in all the nutrition of the almonds, coconut, dalia and the iron rich pohe, jaggery and dates. 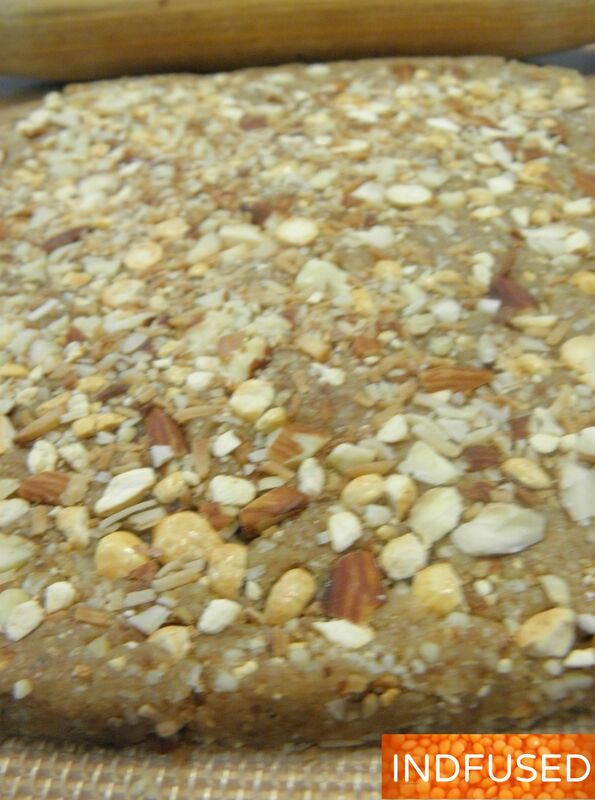 It is a great gluten free snack with a vegan option in recipe too. I used thin pohe for this recipe. Microwave the pohe on high for 1 ½ minutes, stirring every 30 seconds. The pohe then look curled and crisp. Set them aside to cool. Next I toasted the almonds, dalia and dry shredded coconut on a teaspoon of ghee. Start with the almonds and toast them lightly then add the dalia. Stir fry for a few seconds and add the shredded coconut. Stir until it is toasted to a golden brown color and fragrant. Remove from heat and set aside to cool. I used my mini food processor to pulse the pohe- just 2 to 3 times is enough. 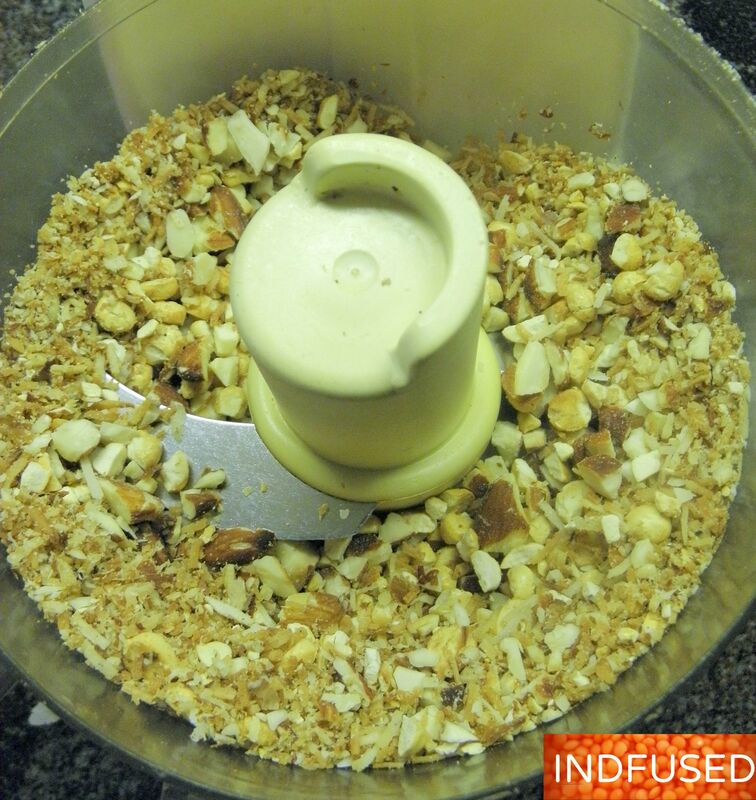 I also pulsed the almond mixture 3 times to turn them into smaller bits. I reserved 3 to 4 tablespoons of the mixture aside. And combined the rest with the pohe. 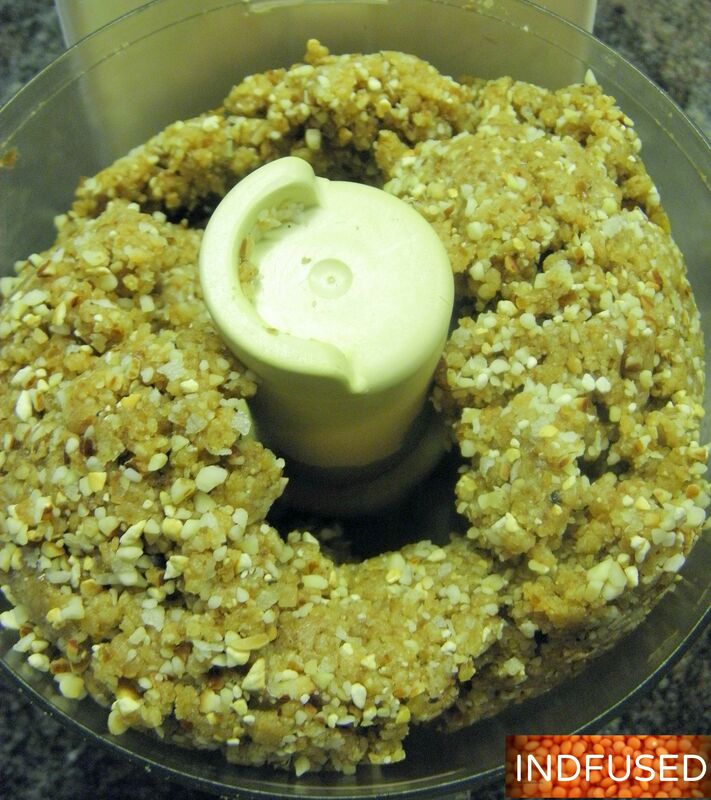 In the food processor bowl, add the jaggery and the dates. Pulse until it is broken down into little bits and is gooey. 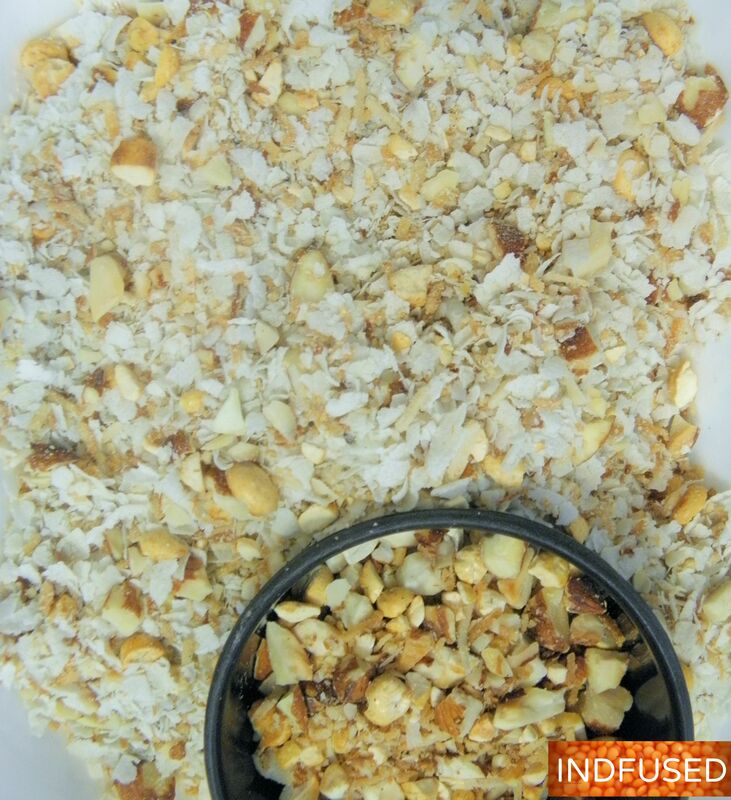 Add the pohe-almond mixture, sea salt, cardamom and nutmeg and keep pulsing the food processor until the mixture comes together and is all clumped. Gul Pohe Vadi ready to roll! Remove the mixture to a greased plate. I have used a baking mat. Roll the mixture out with a rolling pin. Add the reserved almond-coconut mixture on top and roll again. The mixture is pretty pliable and easy to roll. Cut into square or diamond shapes! 1 teaspoon ghee +some to grease the plate. Or coconut oil for a vegan option. In a microwave safe bowl, heat the pohe on high for 1 ½ minute, stirring the pohe every 30 seconds. Remove and set aside. In a pan heat the ghee or coconut oil and toast the almonds, dalia and the shredded coconut in that order, until golden brown and fragrant. Remove from heat and set aside. 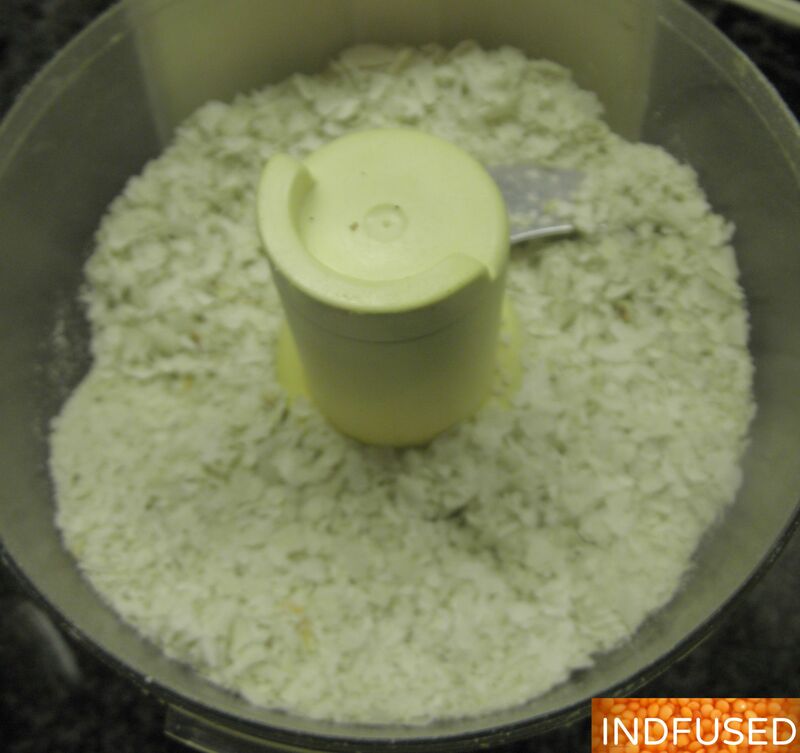 In a food processor, pulse the pohe until broken into smaller bits. Remove. Add the almond mixture and pulse until the mixture is broken into smaller bits. Remove and set aside about 3 tablespoons of this mixture. 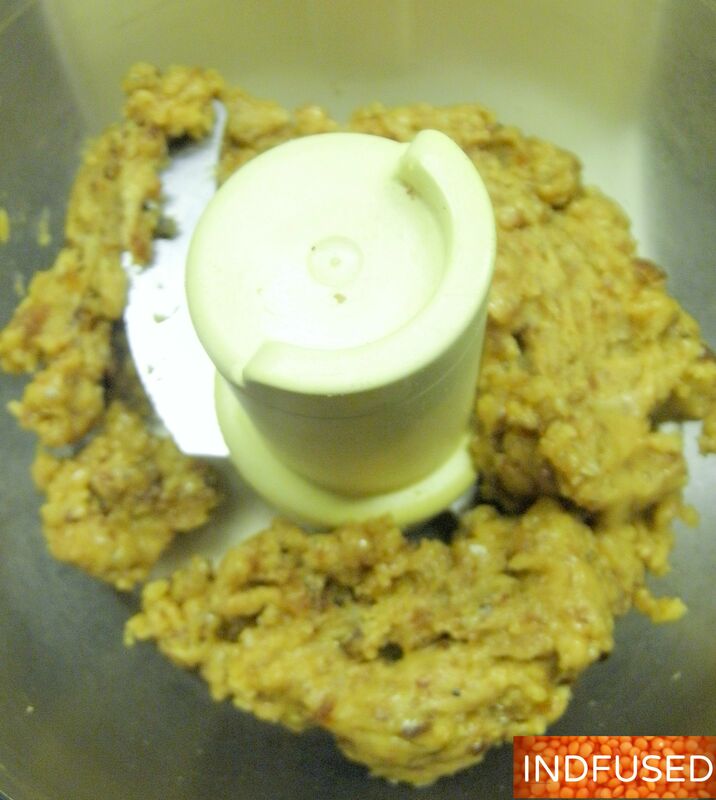 Add the jaggery and the dates to the food processor bowl, and pulse the mixture until it becomes a gooey mixture. Add the pohe, the rest of the almond mixture, sea salt, cardamom powder and the nutmeg powder. Pulse the mixture until it all mixes well and is all clumped together. 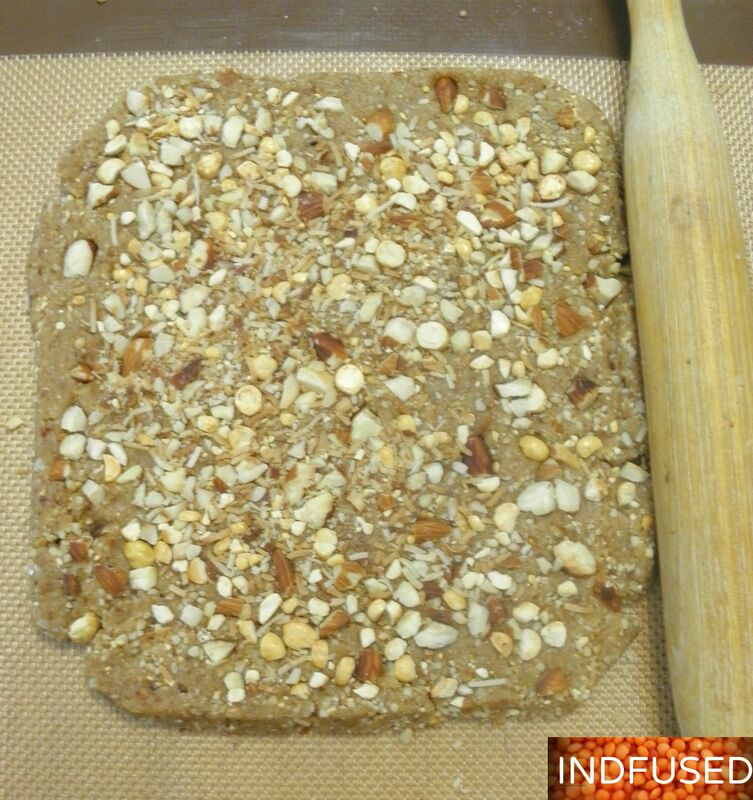 Remove from the food processor and roll on a greased plate or surface to about 1/2 inch thickness. 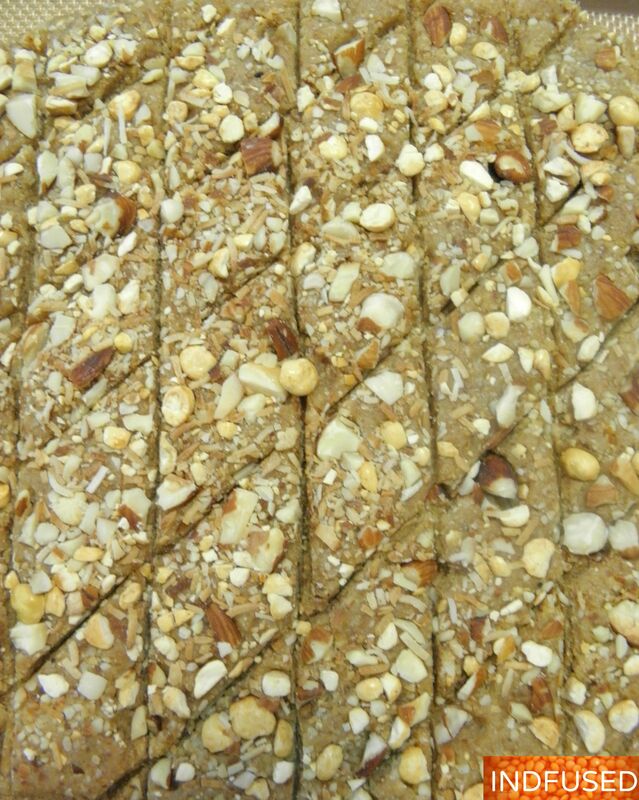 Add the reserved nut mixture on top and lightly roll again to embed them into the vadi/burfi. Cut into diamond or square shape. This easy to make, Gul Pohe Vadi is a hit at our home and I hope that you and your family like it too! Looks delicious and healthy too. When I was growing up we had two dogs, one named Laddu and the other Burfi. Thank you Greg! What cute dog names! Sri Krishan Janmashtami Subhaakaankshalu, Sandhya. Another winner from your ever growing repertoire. Aruna, I am truly flattered and humbled to get such a huge compliment form an accomplished person like you! thank you so much! Thank you so much Swapna! What a huge compliment that is! Sure appreciate it! Gorgeous Sandhya, all my favorite ingredients and I like how you’ve implemented it to suit your family’s tastebuds. I’ve been hearing about this festival coming up through other blogs too, such mouth-watering treats. How else do you celebrate other than making these gorgeous sweets? Thank you Loretta. The gul pohe as such kind of get mushy. So I was happy that I could turn them into a crunchy snack that the children will love. This is Vani from Shishubharati NH and I am amazed at your varied talents. All your recipes look great and the title of your blog is so appropriate. This will come in handy for all the busy Moms/kids out there. Vani, so happy that you saw my blog! Thank you so much for compliment.I am thrilled! Thanks Stephy! You are so kind! This looks good and something that I could possibly make! Thank you so much. It is a great gluten free snack too.Do let me know how you like it! 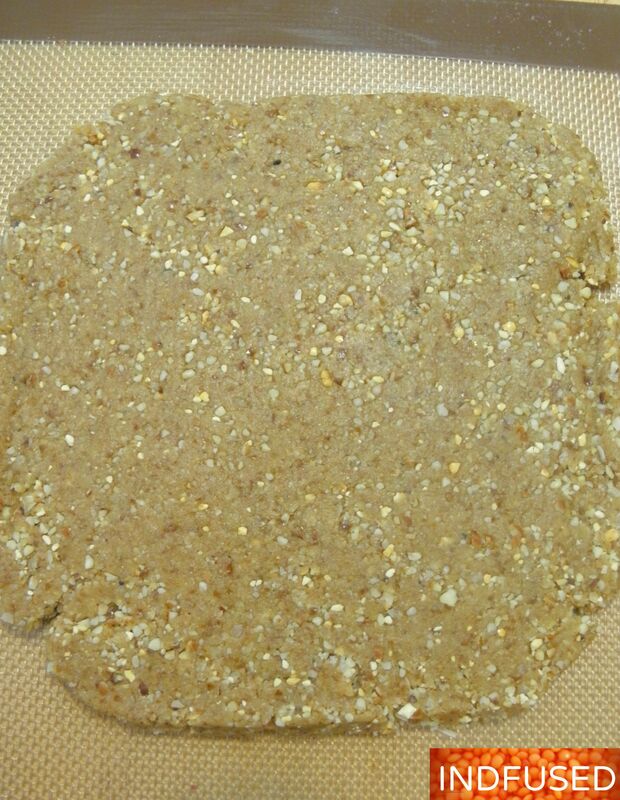 Very unique recipe Sandhya and it looks so delicious! I have the thin poha, so going to try this soon! Thank you Naina! Do let me know how you like it. Almond and coconuts are included! I am sure I am going to love it 🙂 Thanks for the recipe Sandhya! Thank you so much Indah! This is a wonderful twist on the traditional gul pohe. I think I will try it! Thanks for sharing! Thanks so much! We liked it as the vadi has the crisp texture of the pohe. Do let me know how you like it. This wadi looks and reads delicious. Thank you Robin. I liked the turquoise color of that plate too.So glad to know that the instructions/explanations are clear. I am usually chasing my tail with the posts, so many times my posts are written in a hurry. You seem to be very organized with your brilliant posts. They never seem rushed. Thank you sweet Robin! Your words, as always , are perfect! I trust kids since they don’t have a “filter” and say what they like or not, despite how we are trying to get to speak up. So good I feel like makig them right now, but do not have ingredients ;-( Do you take orders? Thanks so much Rita! That is such a sweet comment! I feel that way when I read your recipes for the mouthwatering Parsi cuisine too. I want to try and make your jardalu chicken soon….drooling here thinking of it. Sandhya I am so happy that I tried making these today n is super hit at our house..Sara my 10yr old loved it who is very picky eater.. Thanks a lot..
Roopali, I am so glad that you made it and that Sara loved it! Thank you so much for letting me know. Truly appreciate your kind words. Especially for Krishna Janmashtami! 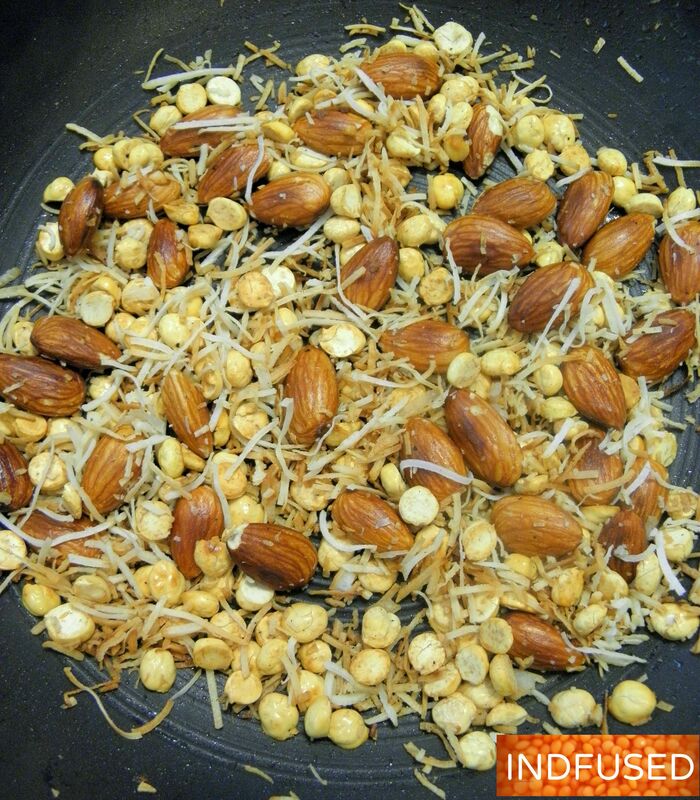 Gul Pohe Vadi is easy and requires no sugar syrup making skills! Sounds easy & tasty, I’m going to try in this weekend. Hope you liked it Megala! This is a great recipe! Will try this. The Gul pohe vadi has all the healthy ingredients in it..your step wise detailed recipes sounds infallible and the dessert looks absolutely delish. What else can i say ? These days I am noticing a lot many recipes with poha. Really I find it it a great point. I love this gul pohe vadi recipe, adding dry fruits it surely makes an energy bite for everyone. Bookmarked this. This looks tasty and fuss free, I should try it sometime. Nice share. Looks so delicious and healthy! Very new recipe. Feels so refreshing to know about the less popular Indian sweets than the same old ones. Great share. Such an innovative dish! They look super gorgeous and yummy. Lovely share dear. 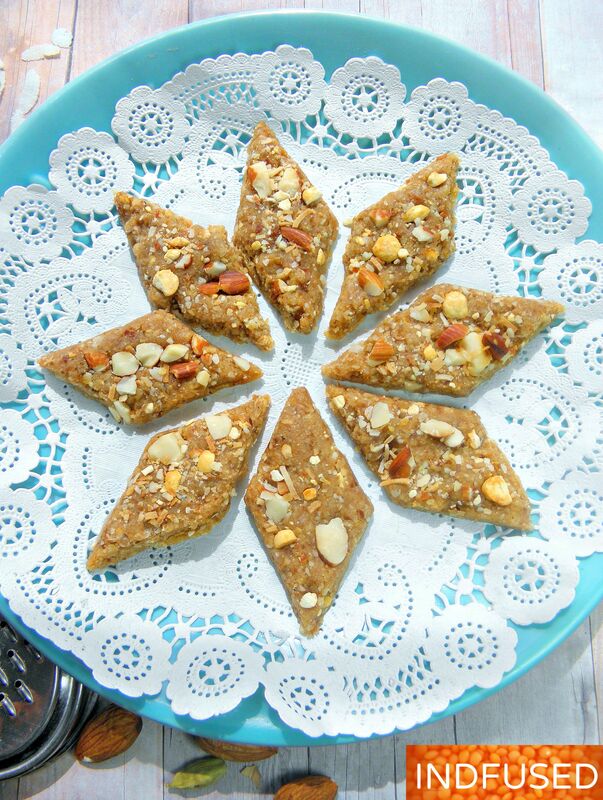 Looks very festive and super delicious, love this gul pohe barfi very much. Yummy share! !